Lauren Zimniski scored her first-career goal, Nicole Lewis made 11 saves, and the Quinnipiac field hockey team defeated Rider for the first time since Oct. 1, 2006 by the final score of 3-2 on a senior day that could not be scripted Sunday afternoon. Prior to the loss on the QU Turf Complex, Rider (9-5, 2-1 NEC) had won their last 25 NEC games. Their last loss before the impressive run was on Oct. 26, 2008. Nicole Lewis added to her exceptional career on Sunday afternoon by grabbing her first win against the Broncos. She now has 26 career victories which is the third most for any goalkeeper in school history. She also holds a 1.64 goals-against average per game this season, and a .798 save percentage. Fellow senior Zimniski netted the first goal of the contest midway through the first half to give Quinnipiac an early 1-0 lead. 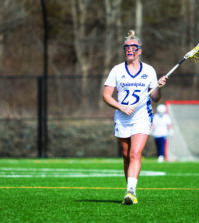 The goal was her first in five years as a Bobcat. She also had an assist, which gives her 12 in her career, good for 11th all-time at Quinnipiac. Lewis and Zimniski were the only two members of Quinnipiac to be honored as a part of their last season before the game. Jess Rusin added her team-leading eighth goal of the season with 35:37 left in the second half. She was then followed up by Kristin Engelke, who scored her fourth of the year. Bobcat’s Zimniski, Jennalise Taylor, Christa Romano, and Danielle Allan all recorded assists on the afternoon. The two Rider goals were scored in the second half by Gabby Burgo and Allison Muschs. Quinnipiac (9-5, 2-1 NEC) heads to Robert Morris next Friday looking to improve to 3-1 in conference play.